Today was a move day. Another cold night at altitude, 39F. I have to admit i was happy if not a bit guilty to be in a pop-up trailer complete with furnace. We quickly broke camp, attached the trailer to the trailer hitch and pointed the FJ westward towards the coast and Bandon. Theresa wanted to mail a couple of postcards so we stopped at the Post Office next to the ranger station. While she was away I pondered whether to get some fuel from the local store. On the way in, I had noticed that gas stations were few and far between. I had slightly over half a tank and would be heading out on Hwy 138; I had no idea if the situation would be the same or not. Only thing was the store pumps wouldn’t be open for another 20 minutes. I erred on the safe side and was so relieved that I did. Hwy 138 follows the North Umpqua River. It’s a beautiful drive as you drop elevation from 6000’ to sea level. It rises in the high Cascades, issuing from Maidu Lake at elevation of 5,998 feet in the Mount Thielsen Wilderness, along the Douglas-Klamath county line approximately 70 miles east of Roseburg. It follows a serpentine course down from the Cascades, westward along the southern side of the Calapooya Mountains. 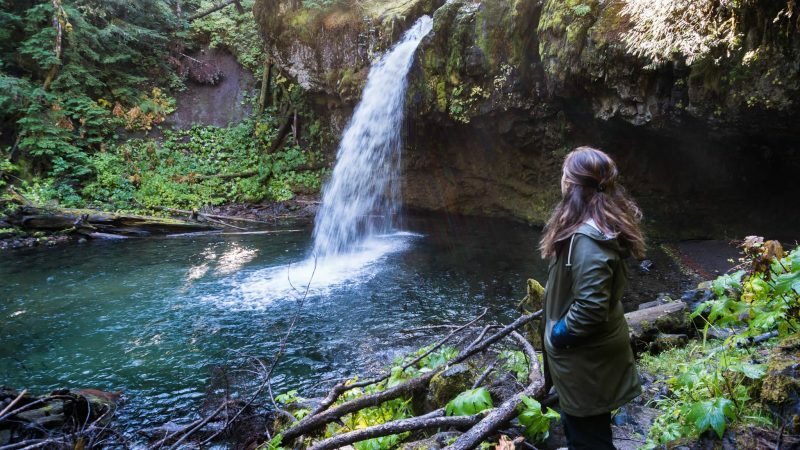 Its upper course passes through the Umpqua National Forest, past Toketee Falls and Steamboat, where it receives Steamboat Creek from the north. 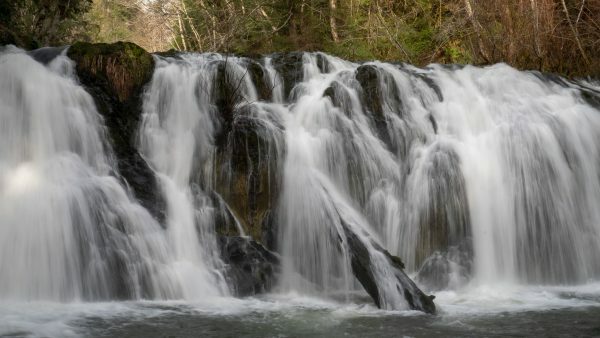 It receives the Little River from the south at Glide (the confluence is known as the Colliding Rivers) and joins the South Umpqua from the east approximately 5 miles northwest of Roseburg to form the Umpqua. 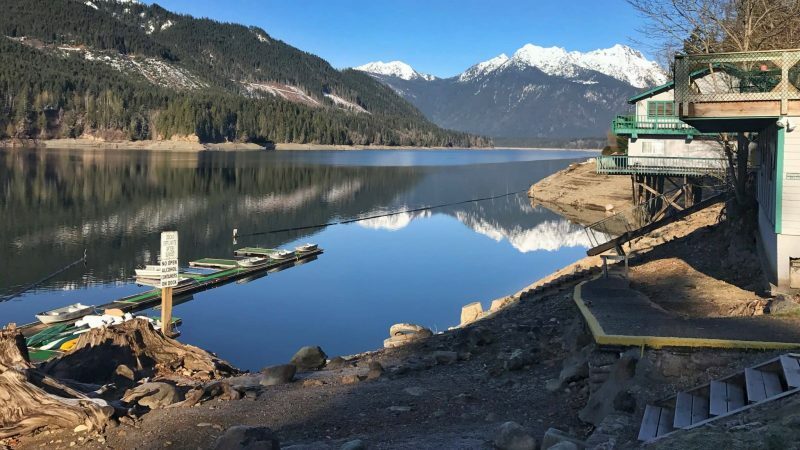 It is impounded in its upper reaches in the Cascades to form Lemolo Lake for hydroelectricity. It is also impounded for hydroelectricity at Soda Springs Dam, forming a small reservoir on the upper river. The river’s reputation as a world-class steelhead stream and its famous emerald waters are a result of the fact the river source is high enough in the Cascades to derive from snowmelt during the entire year. The melting snow is trapped in volcanic soil and pumice and released during the summer months, providing an even cool-temperature flow. During the summer the flow of the river is approximately 20 times that of the nearby South Umpqua. In its lower reaches, the river’s flow becomes increasingly erratic, in a manner typical of mountain streams of the region. Rapids and waterfalls come into view in a peekaboo fashion as we whipped around corners. Mile after mile of untouched wilderness rolled by our windows, but there wasn’t any signs of houses much less stores or gas station. The one of two that i saw looked liked they had been hit by hard times and closed for years. After 4 hours of driving i was so glad to finally see Bandon; a small seaside community that we knew well. When are kids were in grade and middles school we’d rent a small cottage on the bluff overlooking the Pacific and watch the winter storms roll in to vent the energy on Face Rock. However, this time we turned away from the bluff and crossed the river to turn into Bullards Beach State Park. Bandon was founded by the Irish peer George Bennett in 1873. George Bennett, his sons Joseph and George, and George Sealey came from Bandon, Ireland. The following year the town’s previous name of Averille was changed to Bandon after the town of the same name in Ireland. The next year, Joseph Williams and his three sons arrived, also from Bandon, Ireland. In 1877, the post office was established. In 1880, cheese making began. That same year, Congress appropriated money to build the jetty. In 1883, the first sawmill, school house, and Catholic church were built. In 1884, the U.S. Army Corps of Engineers began construction on the jetty. The park was full of late season fisherman but once the sun went down you won’t know it. I overheard some of them talking of getting a 3 AM start so once the sun went down there wasn’t a soul up. It was like we were in a ghost park full of empty RV’s and tent. Not complaining mind you. We could hear the surf with an occasionally report from the lighthouse fog horn. We finally hit the rack as well. Tomorrow we’d be heading south to Cape Blanco Lighthouse and then Port Orford.